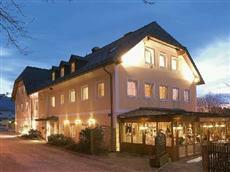 This Salzburg hotel is located two miles south of the city center, which makes for a quiet location. The Austria Classic Hotel Hoelle Salzburg is a four-star accommodation with an easy, twenty minute walk to the Old Town and all of the historic sites Salzburg offers. The Austria Classic Hotel Hoelle Salzburg is not far from the Salzburg airport, and can be reached easily by public transportation or taxi. While most points of interest are a twenty-minute walk away, a bus station is located directly next to the hotel. Each of the twenty-nine guest rooms at the Austria Classic Hotel Hoelle Salzburg has been soundproofed. The rooms offer satellite television, alarm clocks, safes, and wireless high-speed Internet. The en suite bathrooms are spacious, and include hair dryers and complimentary toiletries. Most rooms offer a terrace, and non-smoking rooms are easily obtained. The Austria Classic Hotel Hoelle Salzburg is a smaller, modern facility that offers many amenities. The recently renovated hotel houses a restaurant, a sauna, a fitness center, and a playground. Pets are welcome, and bicycle rental is available. A laundry facility and secure, on-site, free parking adds extra convenience.